It is amazing to think that the Boeing 787 first entered commercial airline operation as long ago as October 2011, BTN editor-in-chief Malcolm Ginsberg writes. Its gestation had been somewhat traumatic, with the first aircraft actually rolled out four years earlier on a Sunday in July. That occasion was largely symbolic, as the aircraft was not ready for series production. Once actually in service with lead airline ANA, the plane suffered several serious technical problems including lithium battery fires, but that is all now behind it, with 530 delivered to 62 airlines. 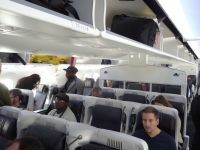 The aircraft has been a great success with passengers and, as 20% more fuel efficient, very popular with airlines too. The 787, called the Dreamliner, is a pioneering aircraft, with the use of composite materials as the primary material in the construction of its airframe. Its distinguishing features include mostly electrical flight systems, raked wingtips and noise-reducing chevrons on the engine nacelles. It shares a common type rating with the larger Boeing 777 to allow qualified pilots to operate both models. Air France had been a lead airline with the Boeing 777 (it now has 70 in its fleet). For the 787 it took a different approach, coming in late with deliveries of the Dreamliner, a stretched Dash 9 version, with 276 seats starting only this year. A single aircraft has arrived to date. Air France has a total of 15 on order. 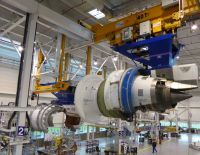 Subsidiary company Air France Industries, the in-house engineering organisation, had already gained certification with contracts under way with 787 operators for third-party maintenance services. The aircraft is laid out with 30 Business Class seats, 21 Premium Economy and 225 Economy. 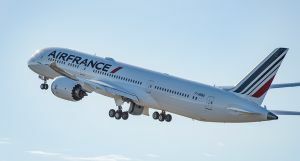 Rather similar to its Airbus A380 introduction, Air France has chosen initially to put the 787 on the Paris Charles de Gaulle – Heathrow route, this going down very well with customers. Business Travel News was invited on an initial flight, the 07:20 departure full. The word quickly got around with the regulars. The return trip, somewhat more mundane, was on an A318, just 131 seats and one-third empty. From the subline to the less so. Large and then little. Air France KLM is the main user of the SkyTeam lounge in Heathrow T4. To my mind, it is the easiest terminal to use at the airport, less busy and with very easy parking. The Piccadilly Line service frequency is not as good as for the Central Area (T2/T3) and you need to find the free Heathrow Connect train if you want to take the Heathrow Express or visit another landside area of the airport. The lounge itself is on two floors, has both business and children’s areas and also a spa. With partner airline Delta moving in its entirety to T3, there is no requirement for a heavy meal service, but a full English breakfast is available in the morning. Frankly one is spoilt using a fully designated top quality long-haul aircraft on a flight of less than one hour. There were some minor negatives. No champagne on boarding, wi-fi inoperative and the coat hangers had not arrived for the wardrobe. None of the famous Dreamliner mood lighting either. Just no time. The on-board service is what you get on a normal flight to and from Paris, with no choice even in Business Class, but somehow with a large table and room to spread around, it seemed that much better. Noise-reducing headsets were included and even with little more than 45min in the air, one was able to select a short documentary (in English), hardly noticing the landing. With its large windows and less rarefied atmosphere (it is kept at 6,000ft), the Dreamliner is a dream. Compared with A320/Boeing 737 short-haul single aisle operations, the flight was a real joy. The herringbone layout for the seats is spacious and access is direct from the aisle. There are no fellow travellers trying to get to the back of the plane. 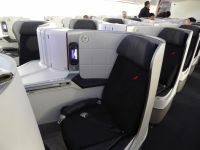 By being a later customer for the 787, Air France has been able to draw on the experience and mistakes of other carriers and come up with a cabin package which is among the best. The 1+2+1 arrangement will not suit all as seat units are common pods, and while conversation can take place between the two central passengers, any closeness is impossible. There is a pull-down divider. The seats can become fully-flat beds and we are told that you are provided with a feather down pillow and a soft duvet (in glacier blue and warm grey) on long-haul flights. The aisle arm seats go up and down, a nice touch, and a big improvement from that offered elsewhere is a special individual reading light, part of the furniture that can be swivelled to suit. The 16in touchscreen can also be controlled from what is a very good version of a typical airline keypad, but with a screen. The usual power outlets are supplied. I took a quick look at the Premium Economy cabin, with 2+3+2 layout and a seat that is 2.5cm wider than the previous offering with a recline of 130deg in a fixed shell so as not to disturb the passenger behind you, and more legroom. Additional storage space and innovative features included an individual reading light, table with a groove for positioning a digital tablet or book, an electric socket and USB outlet. The Dreamliner will be used on selected services to Paris throughout the summer. If you are eligible and connecting on to a SkyTeam flight out of Terminal 2E, you can use the excellent Air France lounge in M, and also perhaps take advantage of the complimentary 20min Clarins relaxation treatment. 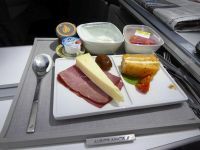 Premium Eurostar or Air France 787 Business Class to and from Paris? For the next six months or so, there is only one winner. And the back end does not look bad either.